Joel Edgerton‘s edgy horror/psychological thriller unravels the commitment-phobic fears of modern living, turning the clear divisions between protagonist/antagonist on its head in the process. Have you ever run into an old school chum, perhaps while visiting your hometown? This old friend seems way more invested, eager to “catch up” and pick up where you left off, oblivious of the fact that you may have a wife, kids, a job, commitments a-plenty, and just don’t have time to kick back and spark one up on the couch, reflecting on old times? But what if your old friend is going through a rough patch and just needs a friendly face and a sympathetic ear? Here’s your chance to do the right thing and be a true friend, but too often, we falter, succumbing to the fear of wasting our precious, precious time. It is this psychological push-and-pull that is the tightwire on which Edgerton’s excellent thriller balances, ratcheting up the tension as tight as that tightrope, never letting go. It’s a nail-biting, edge-of-your-seat ride the entire way. The Gift tells the story of Simon, played by Arrested Development‘s Jason Bateman, and Robyn, played by the luminous Rebecca Hall. Simon and Robyn have re-located to Southern California for a fresh start, to a town a few miles north of where Simon grew up. While shopping for furniture, the couple run into an old school friend of Simon’s, Gordo, played by film director Joel Edgerton. Gordo shows himself to be a caring, compassionate old friend, despite the fact that Simon doesn’t remember him for the first half of the conversation. Things start to get a little weird when Simon and Robyn find a red-wrapped wine bottle on their doorstep from Gordo, welcoming them to the neighborhood. Neither of them can remember giving him their address. The gifts continue as Gordo ingratiates himself into their lives. A series of unannounced drop-ins, and a never-ending barrage of packages and thank you notes keeps this newly rekindled friendship going, despite Simon’s misgivings. Simon thinks he’s a creep, and an unseen vicious side in Simon begins to emerge, as Robyn’s sympathies are activated. She thinks Gordo’s nice; misunderstood. She’s got a dark and troubled past that makes her softer and more sympathetic than Simon, a perpetual winner and go-getter – lying, cheating, and defrauding his way to the top. It is the secrets that ultimately serve as everyone’s undoing, albeit in a way you never, NEVER see coming. 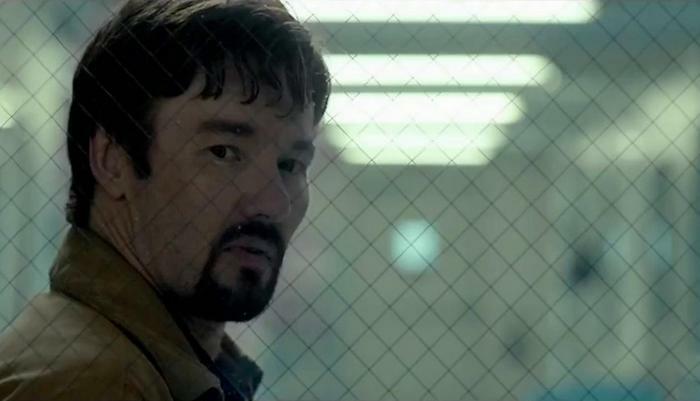 The Gift really asks the audience to ponder who is the “good guy” and who is the villain. Simon’s power-hungry yuppie friends – in a ceaseless cavalcade of banal, wine-sipping dinner parties – are the absolute worst. They never think about anyone but themselves, perfectly happy to ignore the problems of the world and the people that have them. Their mantra is “that’s your problem, deal with it”. These are the people who can’t be bothered for a dollar, although they have a million. Joel Edgerton called upon classic nerve-wranglers like Cache, Funny Games, Cape Fear and Fatal Attraction when making The Gift, as he told the website Popsugar. The Gift is more slo-burn psychological pinpricks than giallo splatterfest, because of these timeless influences. Edgerton’s not afraid to employ modern horror techniques however, most notably- the jump scare. These pop-outs are particularly effective with the skullcrushing volume of modern sound systems, as is the hybrid electronic/orchestral score from Danny Bensi and Saunder Jurriaans, which draws a line from François-Eudes Chanfrault’s High Tension soundtrack to the moody, gloomy, epic strings of Danny Boyle’s 28 Days Later, so make sure to see it in the theater, given the opportunity. The pacing is superb, never dragging, always clipping along. The Gift takes place over the span of maybe a year. Months come and go and it almost seems things will go back to normal. They don’t, and they shouldn’t. 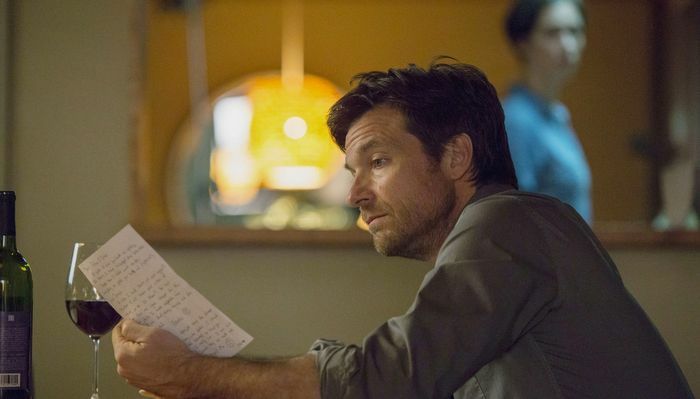 The movie is loaded with psychologically-loaded symbols, such as Jason Bateman’s childhood fear of monkeys, which re-occurs throughout the film. It is unclear from the story if this is foreshadowing or depth psychology. Seems to me, a little bit of both. It invites re-investigation and exploration. Does Edgerton show Robyn jogging multiple times as an illustration of the banal repetition of socialite life, or merely as a way to set up what comes next? 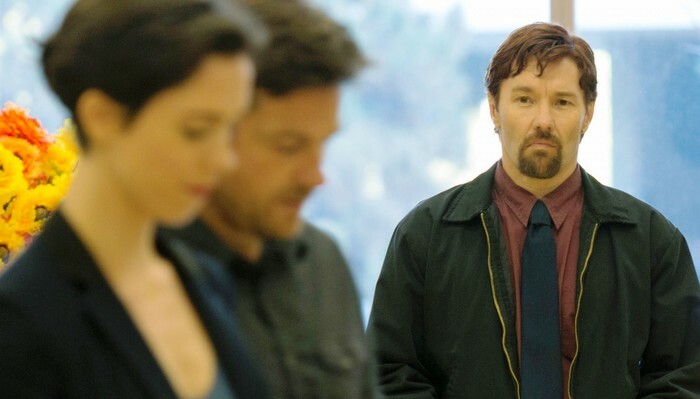 Judging from the fact that Edgerton wrote, directed, and starred in The Gift, it is clear that this is a passionate labor of love, which leads me to believe the symbolism is quite intentional. Edgerton is saying something with this movie. He’s making a point. Judging from the fact that the audience began to cheer as terrible things and tragedy fall on the supposed protagonists of the film, it seems that Edgerton has been deadly effective in this goal. CONCLUSION: For fans of classic psychological thrillers, a la Hitchcock, to clean, clear modern horror, there is something in The Gift for all lovers of edgy cinema that dares to make you think. This entry was posted in Out in Theaters, Reviews and tagged Jason Bateman, Joel Edgerton, Out in Theaters, Rebecca Hall, Reviews, The Gift. Bookmark the permalink.